Outside my Window... it's sunny right now, and although the forecast says we may have some more thunderstorms this afternoon, this rest of the week is suppose to be gorgeous! I am thinking... about Gabriel, the baby we miscarried last November at 11 weeks. My due date was this past Saturday, June 13th. I've had quite a few friends that were due around my due date, and even though I am so happy and excited for them, I can't help but think about our little one when I see their babies. I was prepared for that, and I am sure the fact that we have a new little one on the way makes it much easier than it would have been otherwise. I am thankful... that this pregnancy is going well so far, and that I get another little sneak peek at the baby during my appointment next Monday. I am also so thankful for all of your prayers! Living the Liturgical year at Home... Summer with the Saints started last Thursday, and we are hoping to be able to make it each week. 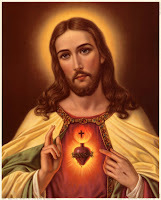 Since the month of June is dedicated to the feast of the Sacred Heart of Jesus, and since this coming Friday is the actual feast day, I think Marci is planning this week's Summer with the Saints in honor of the Sacred Heart. Saturday is also the feast of the Immaculate Heart of Mary, which was one of the themes last summer. I am also thinking about making Cappuccino Mousse Trifle tomorrow, in honor of the memorial of the Capuchin Martyrs of the Concentration Camp and the anniversary of St. Pio's canonization. If you are looking for a great movie about St. Pio, my husband posted a review on Padre Pio:Between Heaven and Earth . I haven't watched it yet, but he says it is wonderful! I am going... to take my dear friend and her family dinner tonight. She delivered twin boys on June 3rd, and they are SO SO darling!!! We were so excited to get to meet them yesterday after Mass. I am reading... lots of fiction. After finishing Regina Doman's fairytale series, I moved on to The Ranger's Apprentice Series and have really been enjoying them as well! Great books!! I am hoping... to have a chance to start working through the 300+ emails in my inbox... They have all been read, but I tend to run out of time for responding! ;) I have really enjoyed hearing from some of you though, so thank you for the emails, and hopefully I'll be in touch soon. Around the house... Happy Flowers!!! I was so excited when hubby let me redecorate my girls room on Saturday. It really did cheer me up and keep me busy! We still need to touch up the paint on the walls and hang some pictures. I am also thinking of adding curtains and some matching wall decals... We'll see! One of my favorite things... is Summer with the Saints! It is SO nice to be able to celebrate the saints and "just SHOW UP!" Thank you Marci!! Start packing for, and attend, Family camp. Celebrate Snuggles 2nd Birthday this weekend. Lowden LOVED the Rangers Apprentince series. He is on Goodreads now and has lots of good books listed. Hey I was wondering...are you going to do the ticket program thing again this summer. My kids are begging for it. Have you stopped using it? Have you made changes? I'd love to hear your thoughts. I can't even remember it...I will have to look for my old post. LOL. So cute! Ava has the same bedding! Love it. Pottery Barn, right? So cheerful and a nice transitional design that can grow with them for several years. I found a cheap knockoff for my girls at Walmart that I just loved. Similar colors though their walls are pink with a light sage rug. I can't wait to see the finished room.